Ghent University researchers used computer simulations to discover a new material that efficiently produces chemical building blocks for fuels and plastics without using crude oil.The reaction takes place in a material with pores on the nanoscale. 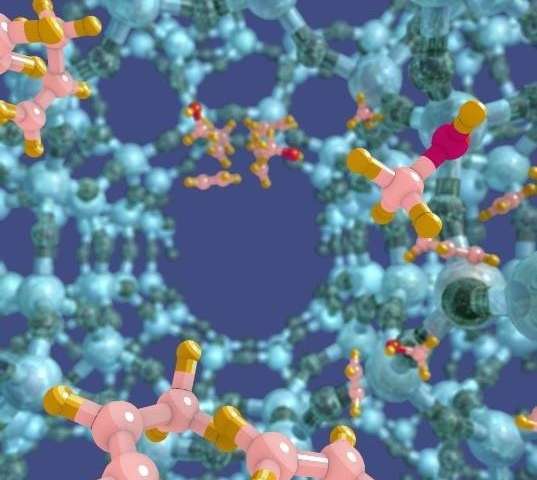 The international research team discovered an ingenious way to boost the performance of such material by adapting the architecture of the catalyst at the molecular level through a combination of computer simulations and experimental tools. The simulations were performed at the Center for Molecular Modeling of Ghent University (molmod.ugent.be) under supervision of Prof. Veronique Van Speybroeck and Dr. Kristof De Wispelaere. The exceptionally exciting results provide design guidelines for a new generation of materials that will leverage the transition towards more sustainable chemical processes and were published in Nature Chemistry.